Turtle Beach has announced that it had built its first transparent directional speakers featuring its HyperSound technology. The company demonstrated an early prototype of the speaker set publicly at the E3 trade show, but does not reveal when it expects the new tech to be commercialized. Turtle Beach’s HyperSound Glass is comprised of multiple layers of thin transparent films, which can generate a narrow beam of ultrasound (high frequency sound) that delivers audio to a targeted listener (by the time it reaches the targeted spot, ultrasound becomes normal sound) and does not disturb others. Since the speakers produce ultrasound, the audio is inaudible in a very short distance from the speakers and is also claimed to be imperceptible in locations outside of the targeted area. To generate that beam, Turtle Beach uses the HyperSound software technology, which the company already commercializes, but not with glass. According to Turtle Beach, the sound generated by its films maintains clarity over longer distances than traditional loudspeakers (which may well be correct given the size of the “driver”), but the company does not reveal technical specifications of its devices, such as frequency response or wattage. As pointed out above, the HyperSound tech is not something completely new. At present, Turtle Beach offers its HyperSound Clear 500P speaker system for those with hearing problems and their families. The HyperSound Clear 500P do not feature transparent speakers, but can beam loud audio to a specific spot, whereas those around will hear normal volume audio. The product does not use glass/films, but a special metallic grill to produce ultrasound. 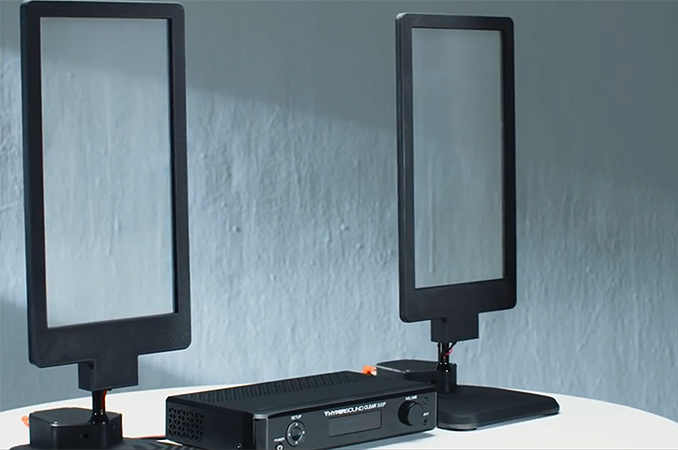 Turtle Beach claims that the HyperSound Glass could be integrated into various monitors, desktop speakers, and automotive dashboard glass to deliver sounds to specific listeners. Turtle Beach does not plan to build products based on the HyperSound technology exclusively itself, but can license it to others. The HyperSound Glass technology is still work in progress and we have no idea when this tech could be commercialized. Nonetheless, since Turtle Beach showed off prototypes at E3, it is highly likely that the technology is nearly ready. meh, I just bought a pair of these ugly things for my daughter cuz they are so vanity. Those are just standard drivers mounted in what appears to be a clear plastic sheet with graphics. That has absolutely nothing to do with this technology. I believe this isn't present to consumers for so long cause this guy probably sold the large part of it to military. "which can generate a narrow beam of ultrasound (high frequency sound) that delivers audio to a targeted listener (by the time it reaches the targeted spot, ultrasound becomes normal sound) and does not disturb others."